We demonstrate for the first time a proof of concept projector with a secondary array of individually controllable, analog micromirrors added to improve the contrast and peak brightness of conventional projectors. The micromirrors reallocate the light of the projector lamp from the dark parts towards the light parts of the image, before it reaches the primary image modulator. 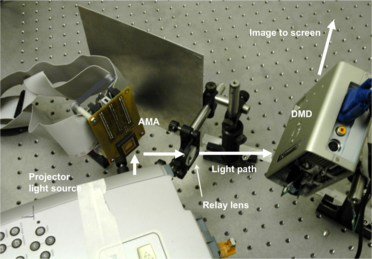 Each element of the analog micromirror array can be tipped/tilted to divert portions of the light from the lamp in two dimensions. By directing these mirrors on an image-dependent basis, we can increase both the peak intensity of the projected image as well as its contrast. In this paper, we describe and analyze the optical design for projectors using this light reallocation approach. We also discuss software algorithms to compute the best light reallocation pattern for a given input image, using the constraints of real hardware. We perform extensive simulations of this process to evaluate image quality and performance characteristics of this process. Finally, we present a first proof-of-concept implementation of this approach using a prototype analog micromirror device.